I am posting my blog a bit earlier than usual this week because, like many of you, I will be travelling to be with my family this Thanksgiving. As I mentioned last week, we have begun the visitation to Ireland that the Holy Father announced in his letter to the Church in Ireland. 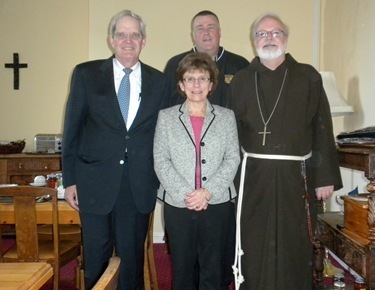 I was accompanied by a team of people from the archdiocese — Father John Connolly, Tom Hannigan and Barbara Thorp. 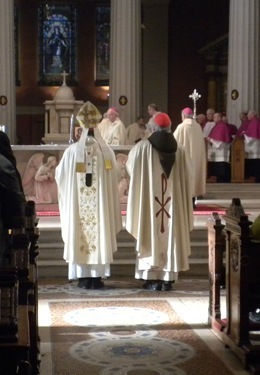 I began the visitation with a Mass last Sunday, Nov. 14 at St. Mary’s Pro-Cathedral in Dublin. 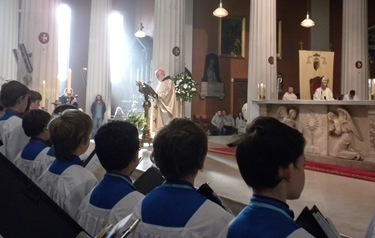 Archbishop Diarmuid Martin had invited us to participate in their patronal feast, the Feast of St. Laurence O’Toole, an Irish bishop who lived about 1,000 years ago and was the second bishop of Dublin. He built the original cathedral, which was taken over by the Anglicans at the time of the Reformation. 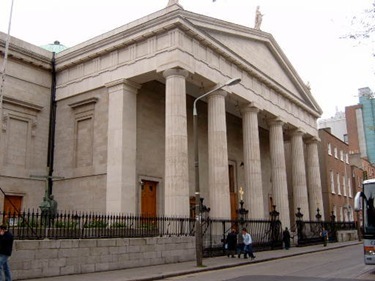 Incidentally, that is why the Catholic cathedral of Dublin, St. Mary’s, is called the “pro”, or acting, cathedral. 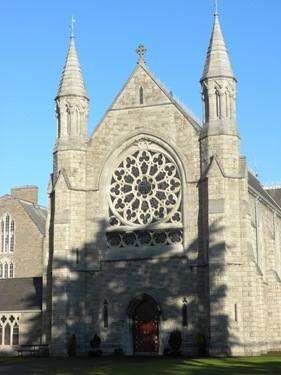 The Cathedral of the Holy Trinity is still considered the true cathedral, the one that was established by the pope and built by St. Laurence O’Toole. 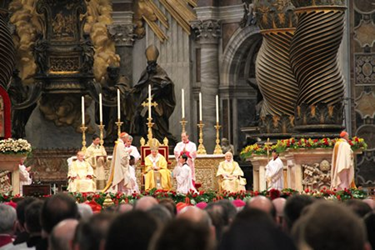 They have this annual celebration of the feast of their archdiocese to which the cathedral chapter, the canons of the cathedral and the auxiliary bishops, are invited. They have a magnificent choir, the Palestrina Choir. The main Mass at the cathedral is a Latin Novus Ordo Mass, with the readings done in English, and the music from this extraordinary choir. In fact, this choir visited Boston a few months ago and sang at the Mission Church. 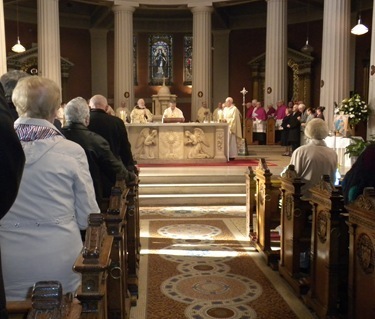 As I mentioned last week, I was able to address the congregation during the Mass. I spoke of how we come to listen, and to make the Holy Father’s solicitude present to them. We came with a great love for Ireland and the Irish people in our hearts. 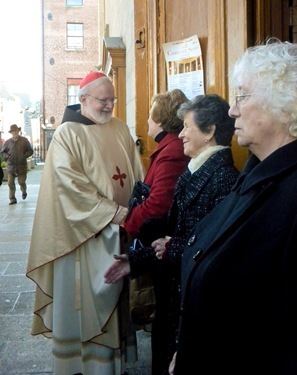 After the Mass, we were warmly greeted by the parishioners. Unfortunately, there was some controversy because of some of the concelebrants who were at the Mass, but we were not there to endorse or indict anyone. We were there to participate, at the invitation of the archbishop, and as a way to begin our visitation in the context of prayer as well as to give some words of explanation to the Irish people. 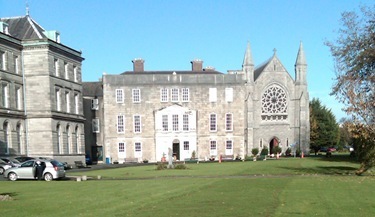 From Sunday to Thursday, we conducted almost 60 interviews of a wide range of people involved with matters concerning the Church in Ireland; those who work in child protection, survivors of clergy sexual abuse, representatives of advocacy groups who assist the survivors, Archdiocesan vicars, lay leadership in the Archdiocese, personnel from the Catholic schools and parishioners who assist with child protection programs at the local level. It was a very intense but a good week. 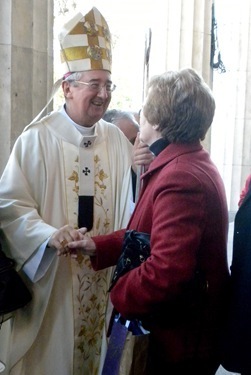 We look forward to returning to Ireland in the new year, to continue these listening sessions and the visitation. 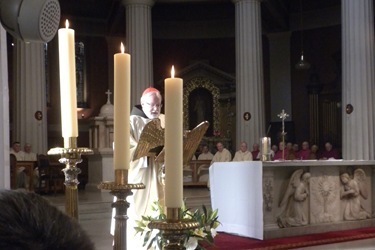 From Ireland, I went to Rome for the consistory for the creation of new cardinals. 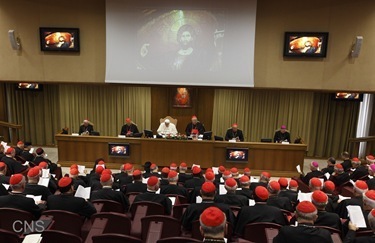 As he has done in the past, on Friday, the day before the consistory, the Holy Father convened a meeting of the College of Cardinals. It was a wonderful opportunity to be with the Holy Father and with each other. There were two sessions, one in the morning and one in the evening. During the course of the day we discussed many of the issues facing the Church in the world today including the question of religious freedom in light of the terrible persecution of the Church in places like the Middle East. It gave us an opportunity to reflect and pray about these situations. The cardinals did issue a letter of support and solidarity with the Church in Baghdad, which recently suffered a terrible attack, and also in Haiti, where people are suffering so much. 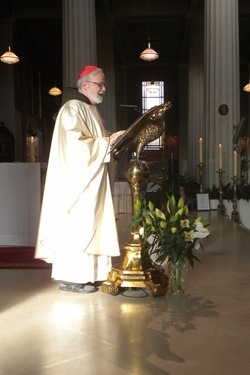 We also spoke about the establishment of the Ordinariate for the Anglicans as well as the sexual abuse crisis. 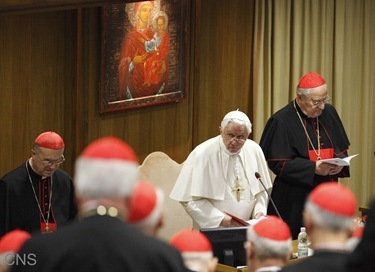 In my own comments during the discussion period, I encouraged the Holy See to act quickly in initiating universal norms on the issue of clergy abuse. I think it was a very productive meeting and an important one in the life of the Church. The rest of the time in Rome was taken up at the consistory. 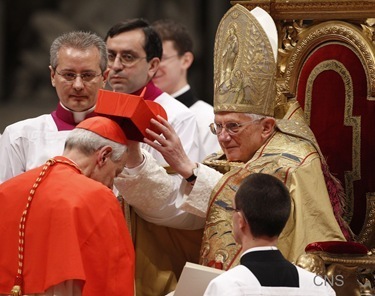 There were two Americans, of course — Cardinal Wuerl and Cardinal Burke — elevated to cardinal. Friday, before the consistory, there was a reception at the American embassy with Ambassador Miguel Diaz, the U.S. Ambassador to the Vatican. 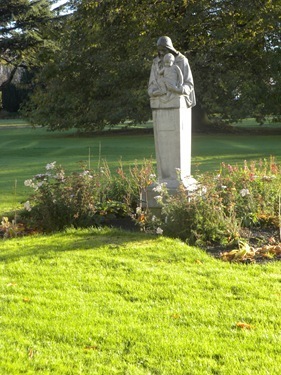 It was announced that President Obama had asked Ambassadors Diaz and Daniel Rooney, who is his ambassador in Ireland, to represent him at the consistory. 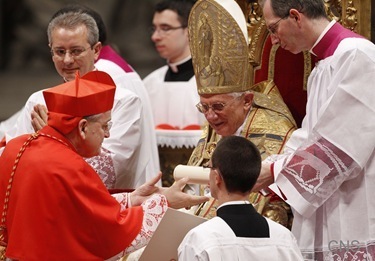 At the reception, both ambassadors spoke, presenting the congratulations of the White House to the new cardinals. 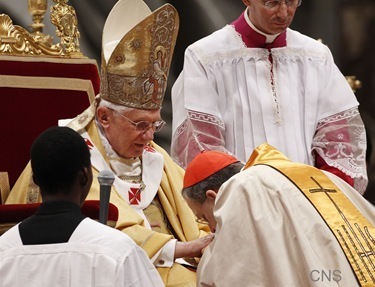 The consistory was in the context of the celebration of Christ the King, the end of the liturgical year. 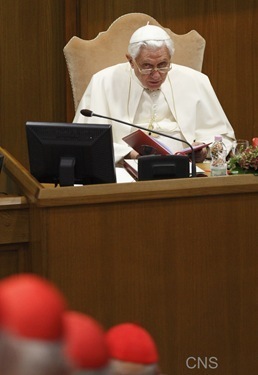 The Holy Father, as always, gave extraordinary homilies both Saturday and Sunday. The events take place over two days. 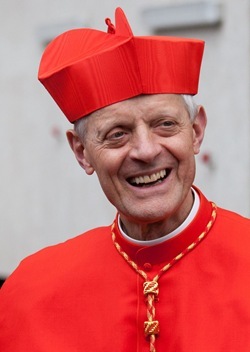 On Saturday there is the consistory Mass during which the men are elevated to cardinal, receiving the “red hat”, the biretta, and the assignment of their titular church from the Holy Father. 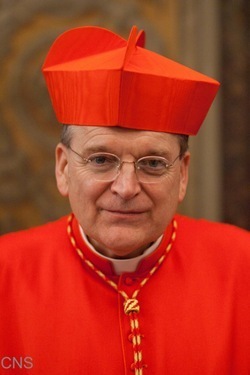 Cardinal Burke received the church of St. Agatha of the Goths, and Cardinal Wuerl received the Church of St. Peter in Chains. Many times consistories are held outside in St. Peter’s Square, but the weather in Rome was not good while we were there. 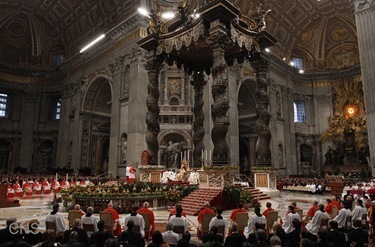 The consistory itself and the Mass took place inside St. Peter’s Basilica. Following the Saturday Mass, there was a gathering at the Pontifical North American College for the cardinals and their guests. Msgr. James Checcio, the rector there, and the people at North American were outstanding in their hospitality to all of us. I met some of Cardinal Burke’s family who are from Boston. They are originally from Ireland, but they now live here. 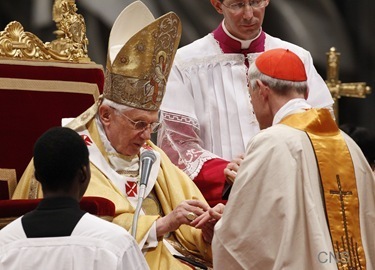 On Sunday, there is the Mass in which the new cardinals receive their ring from the Holy Father. Msgr. Walter Rossi, the rector of the Shrine of the Immaculate Conception in Washington, hosted a dinner on Sunday night for Cardinal Wuerl. I was invited to attend because I am a board member of the Shrine. 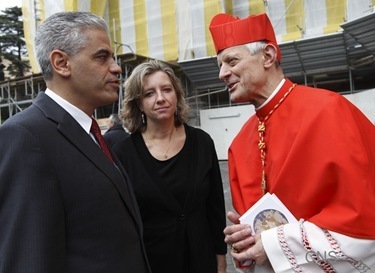 There I got to see a lot of people from Washington, Cardinal Wuerl’s family, and a number of people from Pittsburgh. Finally, before I go, I want to wish everyone a blessed Thanksgiving. This is a wonderful American celebration that is born of our faith in God and our realization of His great love for us, and the need that we have to express our thanks to Him. We do this gathering as families and as communities. I am always amazed even how newcomers to America very quickly embrace the spirit of this wonderful holiday. 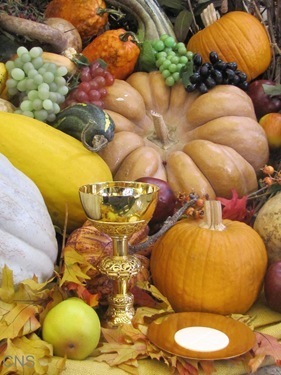 I join my prayer of Thanksgiving to all of those who might be reading the blog, and wish them many blessings as we come together to recognize God’s loving providence for all of us!